Every girl dreams of finding her perfect LBD or even a LRD (Little Red Dress) but I've been dreaming of some LRS ever since I was a little girl. 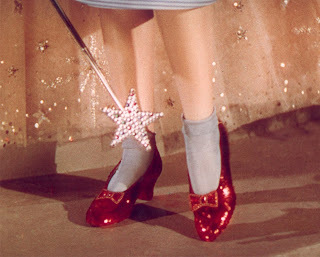 I've been after the perfect pair of red shoes (preferably glitter) ever since I saw these beauties in The Wizard of Oz. 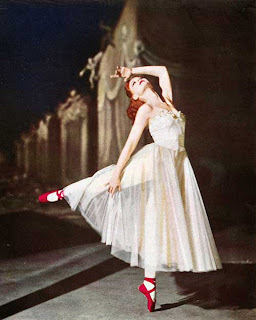 My urge/need/obsession was fueled even more after watching "The Red Shoes" last night. 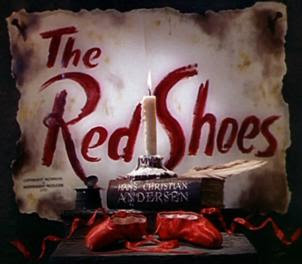 Watching his cult classic is probably the only time I've payed attention to ballet for longer than 2 minutes mostly thanks to the emotion fueled music and dazzling costumes and make-up. There are some options out there but they're either too expensive or I wouldn't be able to bloody walk in them for longer than 5 minutes. Take these ones by Natacha Marro. They've now sold out but they were £485 - ouch! There are some equally lovely pairs on her site though (and a little bit less expensive. Only a little bit mind). I guess I could always get these from Beyond Skin (the vegan shoe brand that Alison Goldfrapp is so keen on) for £98 and spray the glitter on myself. 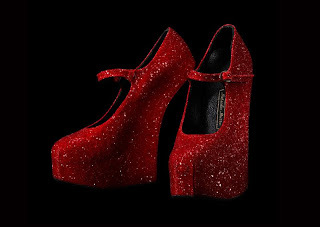 Right now that seems like the only affordable option but if you happen to come across the Perfect Pair of Red Glitter Shoes in Size 6, please do let me know!